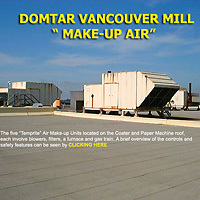 These modules are plant specific and represent machinery at Domtar's Vancouver Mill in British Columbia. 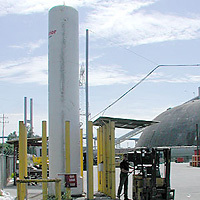 The first CBT (top left) covers the trouble shooting and method of operation of large roof-top air exchange heating units. This training module was put together to train personnel on these complicated pieces of equipment because there were costly mistakes being made in their operation and maintenance. Click on the image to view the module. The next Computer Based Training Module covers the maintenance, troubleshooting and care of "Temprite" indirect gas fired roof-top make-up air heaters. 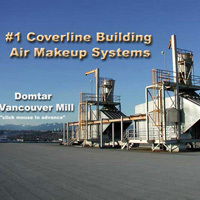 The process in the paper machine and on-line coating machine in the building required large amounts of make-up air which had to be filtered and heated. These units were complicated and required expert training to work on due to the fact they burned natural gas to heat air being supplied to a building where workers were present. Click on the image at left to view the module. The final CBT is in two parts. The first or top title "Domtar Fire Plans" takes the employee through emergency procedures for the plant in the event of fire, earthquake, chemical information (including an online MSDS), propane leak, etc. The second module named "Fire Panels" lists all the fire prevention equipment and their location in the Domtar plant. The front page is an exact replica of the onsite panels, and the individual components inside (just click on the panels to see inside) are exactly as shown in real life. These components include smoke & heat detectors, wet pressure and dry pressure fire systems, pull box alarms and deluge systems. Click on the image to the left to view the modules.